Amid the flurry of people and flashing lights in Times Square, the new ASCE 2015 Convention got started in the heart of New York City this weekend. The ASCE Board of Direction had its October meeting on Saturday and Sunday, including another round of strategic planning, adoption of professional policies, strategic discussions on education and technical advancement, and a discussion of Region boundaries. 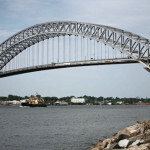 A Bridges By Boat technical tour afforded attendees an opportunity Saturday to learn about the New York metropolitan area’s hundreds of bridges, and enjoy terrific views of many as they approached and passed beneath. Ali Khalilian, P.E., M.ASCE, was still marveling over the tour a day lat er, specifically the ingenuity of High Bridge. Khalilian, the city engineer for Takoma Park, MD, has been to more than 10 ASCE annual conferences, including 2014 in Panama City. He appreciates the continuing education opportunities to earn professional development hours, as well as the Convention’s new approach in 2015. A series of Sunday short courses – detailing New York’s rail mega-projects, four NYC bridge replacement projects, and hurricane response – were among the first PDH opportunities at the 2015 Convention. The Convention’s community-service project collected a group of ASCE volunteers who worked together on Sunday to help the students of Central Queens Academy Charter School. The engineers designed and developed a new outdoor café and volleyball court for the school. “I like just getting involved and being able to help,” said Alyssa Aligata, S.M.ASCE, a senior at the University of New Hampshire. The Opening Welcome Reception brought the attendees together in the Marriott Marquis ballroom for drinks, dumplings, and dragons. A New York dragon dance team performed, while members met and enjoyed the show. Micheline Gerges traveled to the Convention from Lebanon for just such a combination of community, education, and excitement. “I love new experiences and learning new things,” she said.